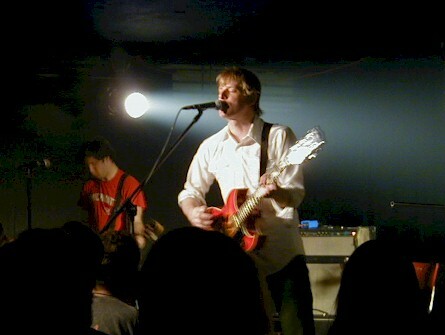 TBT: Spoon’s Britt Daniel at Sokol Underground, April 19, 2001. There were two notable distractions the night of Spoon/The Good Life at Sokol. Distraction No. 1 — Someone had “remodeled” the Underground since the last show I attended (only a few weeks earlier). Gone were all the rock posters from shows over the past 10 years or so. Gone were the band stickers and the markered graffiti. Gone was the flat-black paint job. All had been covered by cheesy faux-pine paneling, washed-out brown and grooved, hardly rock. I asked the promoter about the decor change, and he said it had been like that for a long time. It hadn’t, but he’s not one to notice the details. Distraction No. 2 — the promoter decided to try a different sound system for tonight’s show. More streamlined and not as loud, I could actually listen in comfort with my earplugs kept cozy in my pocket. The promoter thought it actually sounded louder than the usual system (but he’s not one to notice details). Of the 200 who showed up, the ones I asked either gave the PA a thumbs-up or complained because they thought the drums sounded bad. You can’t please everyone. I thought it was the best sound the venue’s ever had. Especially on The Good Life’s set. Tim Kasher’s Robert Smith-like vocals never sounded better, or maybe he’s been working on his annunciation, because I could understand every word he sang. They played a number of songs off their current Better Looking Records release (the dreamy Novena for a Nocturn), as well as a few what I assume were new songs that pretty much fit into TGL’s regular canon of moody, poppy indie songs of love and loss. The sound was remarkably full, thanks to a couple extra accompanists including a guy on accordion and woman (from Bright Eyes?) on keyboard. Vivid memory from the set: drummer Roger Lewis, sitting off the side of the drum riser, smoking a cigarette and looking almost forlorn while the drum machine provided the tick-tock accompaniment for one of the tracks. The house lights were still up, the between-set music still on and people still getting beers, talking and generally mulling around when Spoon began playing their set. “Is he actually starting?” the guy next to me asked. We thought they were still tuning. But no, Britt Daniel had started playing what would be a string of intense rock songs, one after the other, with only the briefest of pauses between them.